Romanticism and modernism, as we know, are opposite concepts. And never the twain shall meet. Rational constructive rigor and ecstatic contemplation of nature cannot be reconciled. And yet, looking at the images of the Planar House and its evocative extension into the landscape, such certainties seem to weaken. At first glance the house created by Marcio Kogan seems to use many of the typical features of the modernist aesthetic: the flat roof slab seen in the houses of Mies van der Rohe, supported by his famous cruciform pillars (literally referenced here), the volumes below, subdivided into precise and iconic functional blocks, the large glazings that take the place of the masonry. The Brazilian studio MK27, located in the chaotic city of Sao Paulo, was founded in the late 1970s by architect Marcio Kogan. Growing over the years with activities and projects around the world, it currently has 30 architects and numerous collaborators in different countries. But this interpretation along the lines of rationalism seems to fade upon closer examination. Reason alone cannot explain that green roof that blends with the landscape, going well beyond the specific requirements of thermal protection and shelter. 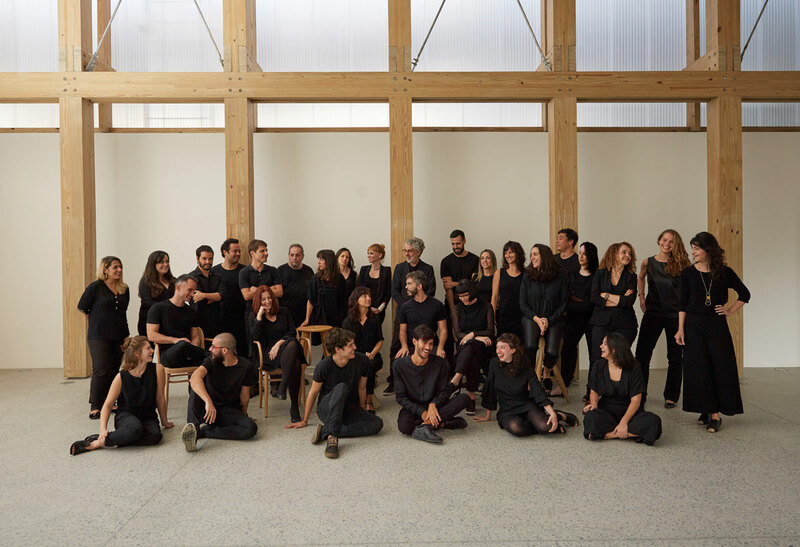 And it cannot explain the ambiguous and ambitious total absence of the glazings at the corners, making the house interact with nature in a much more forceful way than in the other works built by the Sao Paulo collective. Furthermore, rationality cannot justify the appearance – for the first time in all of Marcio Kogan’s architecture – of a curved line, a poetic permeable brick wall that enters the house as if blown by the wind, bringing the sinuous sensuality of this landscape setting into the essentially Cartesian architecture of Studio mk27. 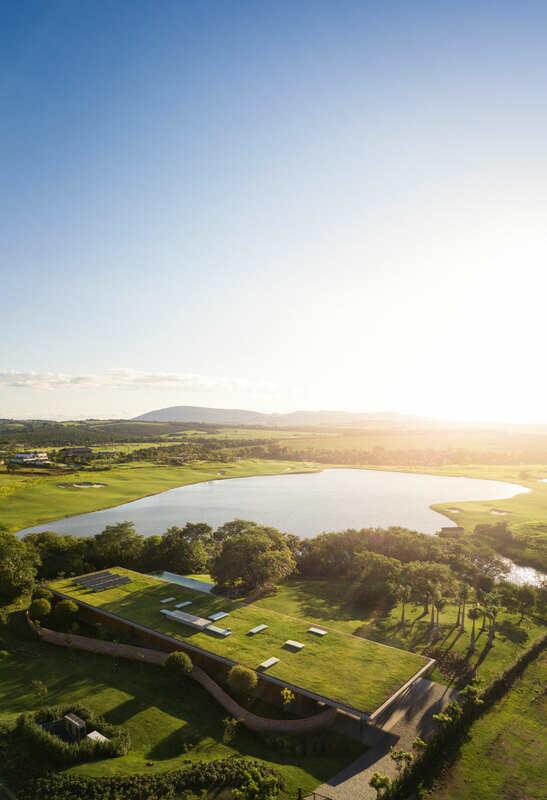 In contact with the emotional impact of the Arcadian setting of Porto Feliz, Kogan’s modernism goes bucolic and the result work of architecture shifts gently into the realm of the masterpiece. 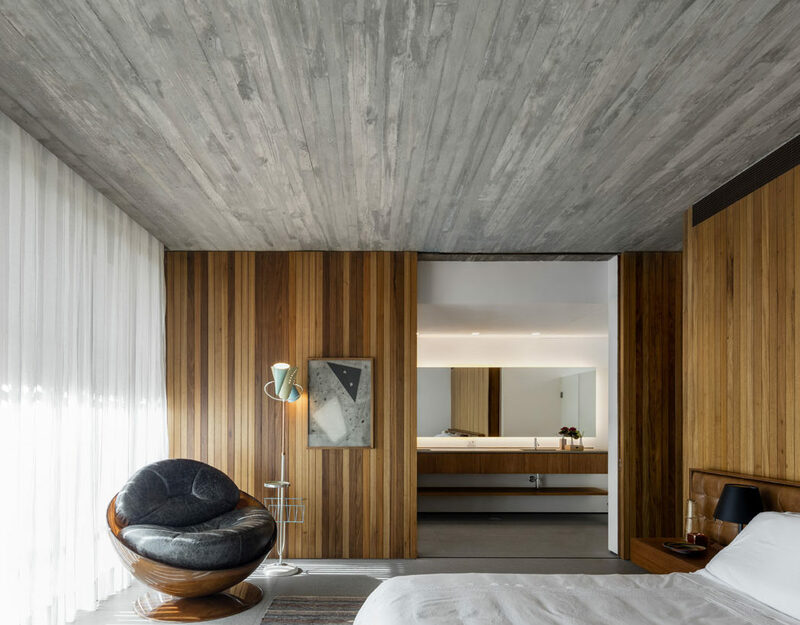 Photo: Fernando Guerra - In the master bedroom, the rounded form of the Esfera chair by Ricardo Fasanello adds dynamism to the linear design of the spatial construction. Siena carpet by Oka Tapetes, sideboard by Studio MK27, technical lighting fixtures supplied by Lumini. The photographs by Fernando Guerra lyrically narrate the perfect coexistence of these two different approaches. We see the logical space compressed below the large reinforced concrete slab with the Miesian pillar, but inside this space we also see a man (co-designer Lair Reis) seated on a strange colorful object hanging from the ceiling. As in the paintings of Caspar David Friedrich, we do not see his face, but his back. We watch him as he watches the landscape, rigorously against the light, ecstatically lost in the vast beauty of nature. The reference to romantic nostalgia is very clear, and here it finds an original connection to Brazilian saudade. In this space, furthermore, the typical plastic indeterminacy of the multi-level home establishes an osmotic dialogue with nature, similar to what happened with the ruin in English landscape design. 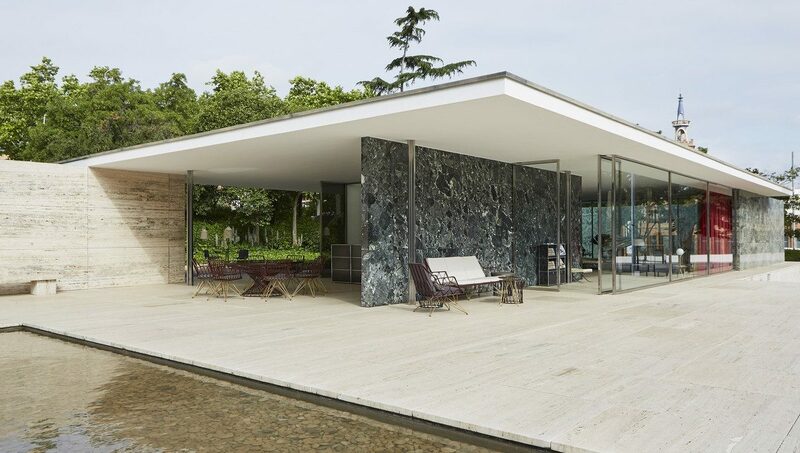 The Barcelona Pavilion is the masterpiece of the European period by Ludwig Mies Van Der Rohe. The Werkbund commissioned him the design of the German Pavilion for the German section of the Exposición Internacional de Industria Eléctricas de Barcelona in the summer of 1928. The roof, completely flat, is supported by eight very thin chrome-plated cruciform pillars that give a strong impression of lightness that reveal the non-supporting character of the walls. The men working on the roof meadow also seem to respond to these idyllic references, calling to mind the farmers with big hats we encounter in the works of Hokusai. They suggest the love of Japan that is increasingly one of the most important drivers in the ongoing evolution of the architecture of Studio mk27. 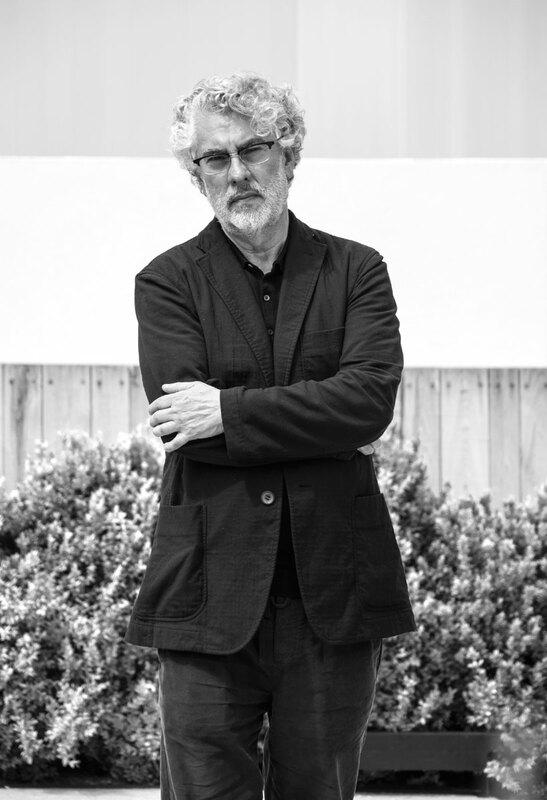 Kogan’s frequent trips to the Far East and his increasingly intense contacts with that culture have brought very fertile themes into his research, much like what happened to Carlo Scarpa: a poetic focus on the threshold, the ritual, the value of gestures induced by architecture and the ability of architecture itself to determine frames of vision and spaces of contemplation. Through the resolved complexity of these heterogeneous crosswise grafts of meaning, the minimal architecture of Kogan moves programmatically and progressively away from the basically anti-humanist trap of today’s minimalism. I think it is essential for an architect to be connected to the world around him. Oscar Niemeyer used to say: "More important than architecture is to be attuned to the world"
It is hard to say if this extraordinary vacation home at a distance of 100 kilometers from the urban chaos of Sao Paulo will be the start of a new phase for the Brazilian studio. What is clear is that it is yet another leap forward, among those over the last ten years that have lead to continuous, gradual evolution of the work of Studio mk27, with manifesto-houses immersed in the landscape. Like the Lee House (2008–12), the MM House (2009–12), the Mororò House (2011–14), the Jungle House (2009–15), the Catuçaba Farm (2010–11) or the iconic Redux House (2009–13), all forerunners in a certain sense of the Planar House. Kogan defines his latest creation as “an exercise in horizontal radicalism,” but it is still a gentle radicalism, because from the outset this studio has seemed immune to provocation for its own sake, never allowing ideology and image to get the upper hand over the true needs of living. 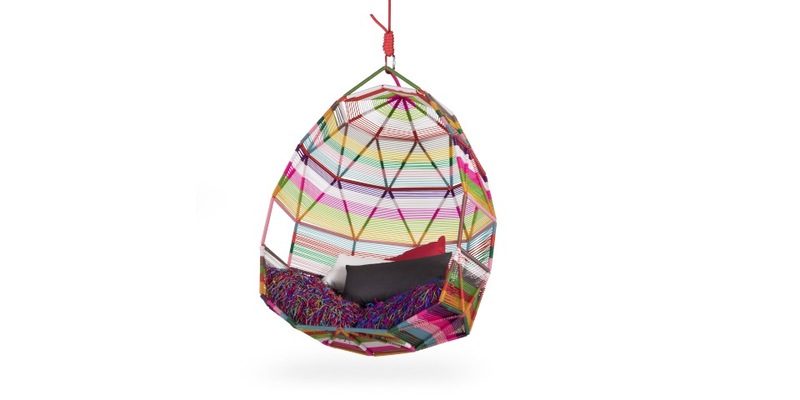 Tropicalia Cocoon by Patricia Urquiola for Moroso. The tubular steel frame of Antibodi becomes the starting point which Patricia Urquiola uses for a creative makeover. The frame is disguised and transformed, the seats assume different personalities according to the material used. The wrapping of thread works like pencil lines, creating a surface which is both graphic and structural, both part of its construction and a form of identity: playful when two or three colours are used, sophisticated in a single colour, elegant in leather. This is why Kogan’s houses are always packed with a sense of domestic calm, and the radical approach of a project like the Planar House is transfigured, in the finished work, by the strategic lack of visibility of all the experimental connotations. This virtuous approach leads to the creation of works that stand out for their very strong harmony, in which the architect makes an enormous effort to innovate without yielding to the aesthetic flattery of innovation. Kogan’s works are thus like authentic residential classics, stating their status as timelessly contemporary works of architecture, where contact with nature and the design of the furnishings generate a perfect habitat for today’s families. The furnishings are carefully selected by a special team in the studio, and positioned to pre-inhabit spaces, which are thus gradually filled with objects packed with humanity and meaning, making the design adventure of the studio in Sao Paulo truly unique. An adventure that is now enhanced by this new and fascinating Brazilian pastoral, which seems to foreshadow new chapters in the thrilling story of Marcio Kogan’s work.